Let's Do It for ME! : SUMMER PICTURE QUIZ - THE WINNERS ARE ANNOUNCED! SUMMER PICTURE QUIZ - THE WINNERS ARE ANNOUNCED! From Jane Hurst and Geoff Allen ..
We’re delighted to finally be able to announce the winners of this years Summer Picture Quiz: In joint first place is Sarah Hill and Helen Cramp who shared the first and second prize of £70. Not far behind them were Charlene Clarke and Karen Ellis who came joint 3rd and both won organic chocolatesWELL DONE EVERYONE! Or I should say Well Done Girls, as there was only one male in the top 10! Very very poor chaps! Must do better next year . Being serious, thanks to everyone who took part in the quiz and also a big Thank You to everyone who made such generous donations. We’re so grateful. 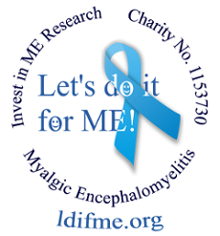 The total amount raised for Invest In ME’s Research fund is £830!! And incredibly this has been matched by a hugely generous friend, and donated to Invest In ME’s Rituximab Research appeal. So in total £1660 has been raised for IiME . Thanks to everyone who helped promote the quiz, it’s really appreciated. For an Answer Sheet, just email Summer-Picture-Quiz@sky.com. 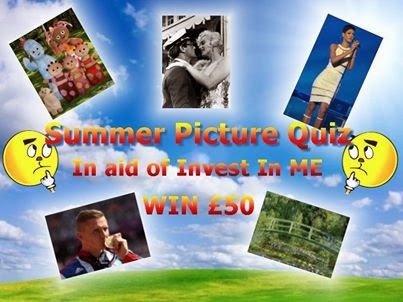 Oh and if anyone would still like to make a donation our Justgiving page http://www.justgiving.com/IiME-Summer-Picture-Quiz-2013 will be open for another 2 months. Thanks again and Congratulations to all the winners! The team would like to add BIG THANKS also to Jane and Geoff for all the hard work they put in to making such a success of the second year of the Let's do it for ME summer quiz. The original matching offer by their friend was £750 so it is extra generous of them to match the full £830 raised. Many thanks and very well done to all involved!! Many Happy Returns Doctor Who!